First I just have to say that the Airport Schönefeld is actually not a Berlin Airport. It is located close to the city, but it is not part of the city – and that comes with a few difficulties. The Airport Schönefeld used to be the main Airport of East Berlin. After the Berlin Wall was built, Airport Tempelhof was located in West Berlin – and East Berlin needed to build its own airport. The airport it actually named after the small town Schönefeld, located in the state Brandenburg which is surrounding Berlin. So it is technically / geographically not part of Berlin. Schönefeld is located south east of Berlin, basically bordering Berlin – some 20 km from Berlin’s city center. There are of course a few different options. 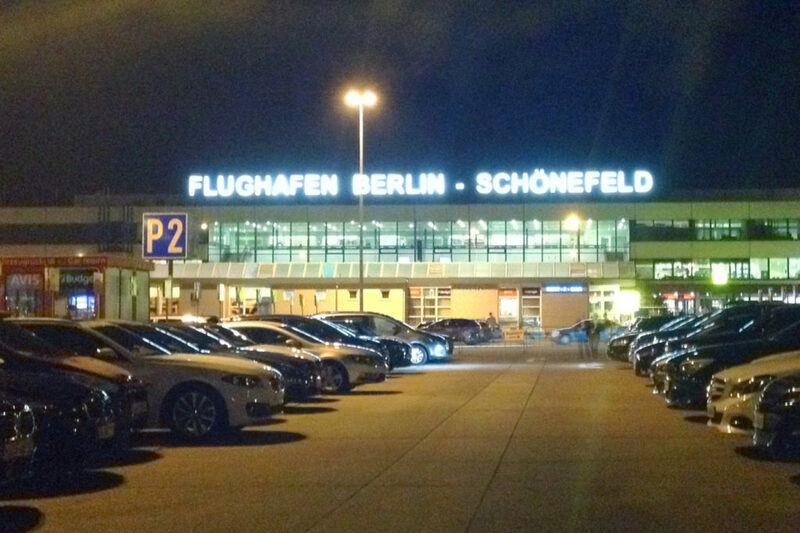 that will bring you from Berlin to Airport Schönefeld – or from Airport Schönefeld to Berlin. Here are a few of the most popular respectively fastest connections. I will first have a look at how you get to the Airport since I suppose that’s the more crucial question – but of course each connection also works to the opposite direction. Taking the train to Airport Schönefeld is probably the most convenient option – although not the easiest. Be aware that the might be a few pitfalls – so you better plan your trip well in advance to avoid missing your flight. First of all I would like to mention that the official information leaflet claims the “Airport Express” would go “every thirty minutes” between 04:30 in the morning and 23:00 in the evening. However, that is not really true. First of all I would prefer saying that there are at some two trains approaching Airport Schönefeld every hour. Sometimes you’ll have to wait for 26 minutes, sometimes for 34 minutes. Leaving Schönefeld in the evening you may have to wait for 19 minutes, 41 minutes or even for one hour for the next train. In my honest opinion that is not really “every thirty minutes”. On the other hand, as far as I can see the last train arrives at Airport Schönefeld at 22:20 o’clock – that’s well before 23:00. Well – to whoever designed that leaflet: It doesn’t really help to sugarcoat the details. Anyways. You can catch einther train from one of the following stations: Berlin-Charlottenburg, Berlin Zoologischer Garten, Berlin Central Station, Berlin Friedrichstraße, Berlin Alexanderplatz, Berlin Ostbahnhof, Berlin-Karlshorst. The final stop is then called Berlin-Schönefeld Flughafen – which is quite near the Airport – but not exactly at the Airport. Feel free to download the official information leaflet from the website of Deutsche Bahn for a table of all arrival and departure times as well as some additional information about the Airport Express. The train station Berlin-Schönefeld Flughafen is quite near the airport – but it is not at the Airport. You will have to walk from the train station to the terminal – expect something like a 10 minute walk. There are probably enough signs pointing in the direction you will have to walk to the main terminal. Otherwise you can just follow the flow of people. Most of the people leaving the train at Berlin-Schönefeld Flughafen will be on their way to the airport. Leaving from Schönefeld can be a bit more tricky. As far as I remember there are not that many signs inside the terminal pointing towards the train station. Look for “Airport Express” – then at the station you may also look for the actual train numbers RE7 and RB14. I suppose y better ask, if you are not sure where to go or which train to take. You can basically ride all Regional Trains (Regional Express “RE“) with a regular BVG ticket – no special ticket needed. Although you will have to use a ABC ticket, valid for all three zones. As of summer 2016 an ABC zone ticket is available for 3,30 Euro from all BVG- and S-Bahn ticket machines, BVG ticket counters and partnering kiosks. See also: Public Transport.